Personal safety applications or SOS applications aim to improve people’s safety while they are travelling and sense something amiss. As the harsh incidents around us increase in numbers, we are compelled to come up with solutions to ensure our safety. SOS applications are used by women and solo travellers as these are the people at the highest risks in today’s society. With technologies such as video, alerts, alarms, GPS, SMS, etc., users in distress are able to alert their close friends and family about their situation. Apparently, most of the SOS applications are made available by developers as freeware software applications, while some others are classified as “freemium” applications, where the general features are available for free and advanced ones need users to go for premium subscriptions at reasonable prices. How Do I Pick A Good SOS App? Video and call recording activation – A good SOS alert application should function as a video or call recorder with a simple button press. Of course, it should promptly send the recordings to the friends and family of the person in danger. Police phone directory – Another feature of a good SOS app would be containing contact information to call the police being in any city and town. The app should keep on tracking the city and location of the user and provide the contact details of the nearest police stations. Emergency help – In times of adversaries, there should be a provision for getting instant help from the police, ambulance, fire-fighters, etc. Delivering notifications to the police – An absolutely useful feature of a great SOS application can be to alert the nearest police department station through messages or missed calls for times when making a call is not feasible. Support for wearables through the mobile application. Hands-free alarm settings so that a fake alarm can be set to get out of trouble. Location-based crime reporting through GPS-enabled SOS alert mobile app. This feature should work with a simple activation function. 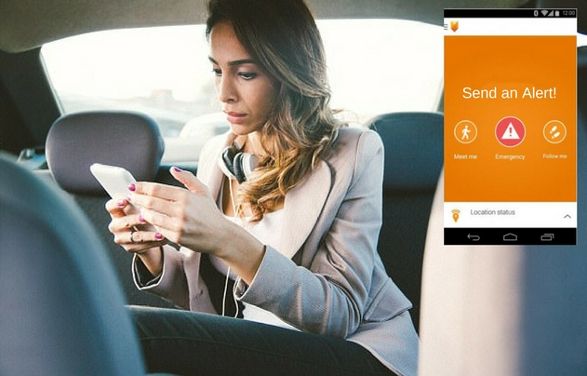 Location-tracking within a close group which can be used by families and friends of travellers and women and would allow them to continuously track the location of the user. Social Media integration to help find others in the same area and notify them through any social media platform. As an example, Facebook’s alerting system can be considered a useful feature for getting the status of the users in calamity-hit areas of the world. Activation through simple phone gestures – The SOS app should be activated through a simple gesture like two long presses of the down volume button, or a vigorous shake of the mobile phone. No false alarms – The gestures to activate the SOS app should not be too trivial to happen when not intended to. These false alarms are dangerous when not needed. Some SOS alert apps on the Android play store have fallen out of their popularity as they gave more fake alarms than real ones! Stability – An SOS alert app has a great responsibility to be as stable as it can be. An application that consumes a lot of memory could shut down abruptly and lead the person using it into danger. Ideally, an SOS app should be low on memory and space utilization so as to ensure its proper functioning. The speed of functioning – A good SOS alert app must be real quick! The UI/UX design and the back-end functionalities should add up not to make the app any slower. When a person is in an adverse condition, time is of the essence. It is important that these apps are built with moral responsibilities in mind. Additionally, a good SOS alert app must be easy-to-use. An elementary interface that looks simple and works powerfully would be a great added advantage of an SOS application. Imagine the hassles of figuring out the functions of an SOS mobile application in the wake of a danger. That would be more of a bane than a boon. A quick UI surely outruns a great user experience when we talk about SOS alert apps. Our expert developers at CDN Solutions Group have developed SOS mobile applications for iOS and Android operating systems for our clients across the globe. Our SOS alert apps keep their users connected to their close ones while ravelling. Our applications help assure the safety of their users by providing them with several of the most important features in an ideal SOS alert app.